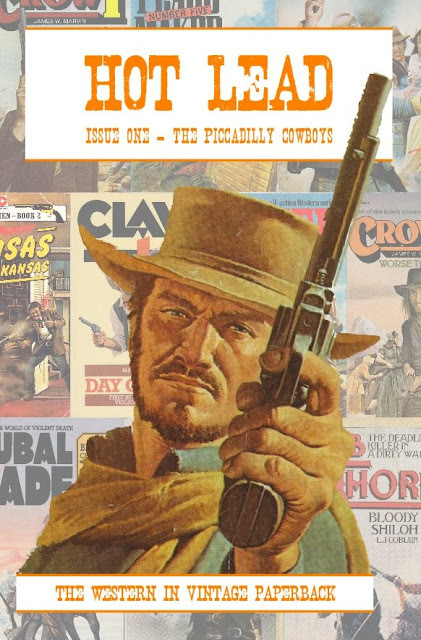 Justin Marriott and I had a blast working long distance via email putting together the premiere issue of Hot Lead: The Fanzine of Vintage Western Paperbacks. We had so much material, the first draft of the issue ran to 100 pages. We wisely decided to split the material into two issues and push back the original Issue #2 line-up to Issue #3 (you can see where this is going). Despite the higher cost per issue ($9.99 in the USA), we believed printing the interior illustrations and exterior covers in full-color was the only choice. We wanted to fill the pages with pertinent articles, reviews, and interviews, but also make the zine visually appealing—especially as we are huge fans of the vintage covers so much ourselves. And therein lies the joy of Hot Lead for Justin, myself, and or other contributors. Hot Lead is a throwback to the days of fanzines—magazines produced by fans for fans in which appreciation of the genre trumps the bells and whistles of the professional newsstand magazines known as slicks. Fanzines are for those of us in the trenches...quick reading with great insights into the genres we love. Fanzines are also notorious for being irregularly published. It's the Zen of the Fanzine, and we embrace it...We have started Hot Lead with the best of intentions—2018 should see 3 published issues—but it is a labor of love produced in the best tradition of DIY Kitchen Table Publishing. We’ll keep you posted.